WAFFLES: Boss! Did you hear that? WAFFLES: "404! 404!" What's it mean, Boss? KATIE: It just means we're not really here. WAFFLES: But if we're not really here, where are we? KATIE: Just click your paws Waffles, and we'll be right back home on our blog tomorrow. 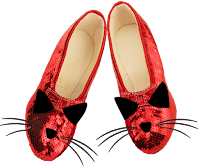 WAFFLES: But don't we need some ruby slippers or something? So What's the 411 on the 404??? Have you ever clicked on a link and gotten a 404 error message telling you the page you were looking for is no longer there? Well, it's just our funny way of telling you that we're not really here today. On Monday we announced our new M-W-F posting schedule. But we figured a few of you might just pop in today for the fun of it. So just in case, we wanted to have something waiting for you to make you smile. If Katie's hair ribbons don't do the trick, surely the cowardly lion will. We look forward to bringing you lots of giggles and funny conversations between Katie & Waffles every Monday, Wednesday and Friday. We'll still be sharing our favorite cat products, hosting cool giveaways and helping shelter cats. See you tomorrow for some Friday feline fun. I feel like I've entered an alternate universe! Whew you scared me for a minute!! Now we're really confused by the 404. And I love the 404 reference. 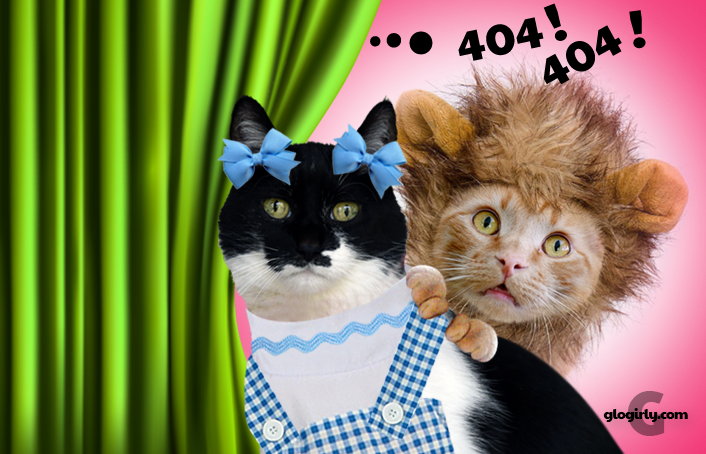 We popped in to see about the 404... ! Gosh darn it! You’re here now more than you ever were. Heh heh! Not that I don’t mind it. Love those ruby slippers- where can I get some? You both look great. Waffles, you show that fierce loin look well. well, we KNOW you've been to Kansas. Tell-all photos at 11!